The top ten recipients of US foreign assistance this year all practice torture and are responsible for major human rights abuses, reports Daniel Wickham. The top ten recipients of US foreign assistance this year all practice torture and are responsible for major human rights abuses, according to the findings of Amnesty International, Human Rights Watch and other leading human rights organisations. This may be in violation of existing US law, which requires that little or no aid be provided to a country which “engages in a consistent pattern of gross violations of internationally recognized human rights, including torture”. All ten have been accused of torturing people in the last year, and at least half of them are reported to be doing so on a massive scale. In Afghanistan, for example, a UN report that torture in prisons continues to be “widespread”, with over half of the 635 detainees who were interviewed claiming to have been abused. According to Amnesty International, torture is also “widespread” in Uganda and remains “common” practice in Iraq. Elsewhere, in Kenya, Human Rights Watch claim that “police in Nairobi tortured, raped and otherwise abused and arbitrarily detained at least 1,000 refugees between mid-November 2012 and late January 2013.” Tanzanians “at most risk of HIV” also face “widespread police abuse” – including torture – and are “regularly raped, assaulted and arrested”. The worst abuses in detention, however, are alleged to be happening Nigeria, where in addition to the “widespread” use of torture, nearly a thousand people died in military custody in the first six months of 2013. A senior officer in the Nigerian army, speaking on condition of anonymity, claimed that “about five people, on average, are killed nearly on a daily basis”. The “abysmal” human rights situation in Egypt, whose government still receives half a billion dollars in foreign aid annually from the United States, is also a pressing concern. 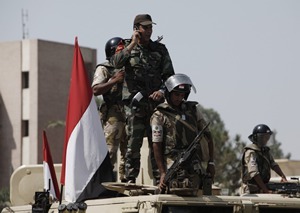 According to Tayab Ali of ITN solicitors in London, “the evidence suggests that Egypt’s military regime has carried out crimes against humanity on a horrendous scale, including murder, persecution, torture and enforced disappearances”. At least 1,300 protesters have been massacred and anywhere between 3,500 and 21,317 Muslim Brotherhood supporters arrested since the elected government of Mohammed Morsi was overthrown in a coup d’etat in July. This would appear to back up the claims of the UN Committee on the Rights of the Child, which last year reported that “Palestinian children are systematically subject to degrading treatment, and often to acts of torture” by the Israeli military and police. Likewise, in Jordan and Pakistan, torture is practiced with “near-total impunity”. The Pakistani authorities have carried out particularly egregious human rights abuses in the province of Balochistan, where 160 people have been extra-judicially killed and 510 “disappeared” over the last year. According to reports from the country’s most widely read English-language newspaper, at least 592 mutilated dead bodies have now been found since January 2010. A number of other recipients of US foreign assistance are also alleged to practice torture systematically. In Bahrain, for example, Amnesty International report that “children are being routinely detained, ill-treated and tortured”, while in Mexico and Ethiopia, torture is described as “widespread”. Controversially, the Obama administration has also recently restored military aid to Uzbekistan, where the UN claim torture is practiced in its “worst forms”. In one particularly horrifying case, a man was actually boiled to death in an Uzbek prison for allegedly being a member of an Islamist group. In spite of this, the United States remains a signatory of the United Nations Convention against Torture, which it ratified in 1994. However, the fact that the top ten recipients of US foreign assistance all practice torture raises serious questions about the Obama administration’s stance on human rights. If the United States wants to be taken seriously on these issues, a serious re-evaluation of its foreign assistance programme is needed. At a minimum, the Obama administration should respect existing US law by placing conditions, such as an end to the practice of torture, on the provision of military aid to foreign governments, which will hopefully then push those governments towards reform and a greater respect for human rights. Well, AIPAC owns our Congress, so we’ll always give them money..and more when Congress is asked for it, as they recently were…Outrageous! As for Egypt, well…gosh! We’ve paid them to be nice to Israel since the old Camp David Accord. In fact, most of our involvement in the Middle East turns around our catering to Israel, a true rogue state if ever there was one. I find it unconscionable that the ‘Greatest nation In The World” (sic) is lead by the needs and whims of Israel. One of the few American politicians that showed even a little bit of spine was Chuck Hagel, who made the BIG mistake of saying “I’m an American first and a friend to Israel second.”..and boy did he get raked over the coals for that gaffe! Even old ‘independent’ Rand Paul has changed his tune. Once, like his father, he felt we should cut all aid to Israel…and he too learned that our Congress is owned body and soul by Israel.